Jazbay Grapes are an ingredient used in Provisioning to make a variety of Food dishes. 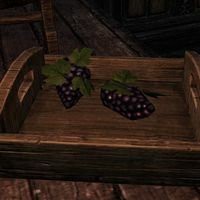 As a fruit-type ingredient, all standard recipes using Jazbay grapes will have an Increase Maximum Magicka effect. 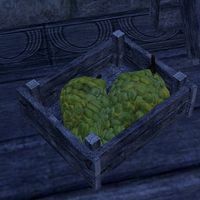 Jazbay Grapes may be found in containers or on tables throughout Tamriel. In the Gold Coast, they may additionally be found in Grape Baskets. Note that grapes found out in the open or in Grape Baskets are always Jazbay Grapes, and not Surilie Grapes. They may also be purchased from Grocers for 00000150150  . Savory Dishes involve Meat and Fruit, and add an Increase Maximum Health effect to the dish. Entremet Dishes involve Fruit and Vegetables, and add an Increase Maximum Stamina effect to the dish. This page was last modified on 4 January 2018, at 23:54.